Do You Know How High the Debt Ceiling Is? According to the Government Accountability Office (GAO), in 2011 the United States government borrowed an additional $1.3 billion due to the political conflict over the debt ceiling. The GAO found that, although bond rates were low in 2011, the Treasury Department paid a premium on many government securities in the eight months leading up to August. These premiums demonstrated the risk of government securities to private-sector debt. Last year, investors demanded that the government pay higher rates than it would have on federal debt with due dates of two years or more. According to the GAO the costs of the political battle over the debt ceiling will be even higher due to the interests costs that the Treasury locked in during the first half of the year which will be paid out over time. Currently, the legal borrowing cap is set at $16.394 trillion. The government currently has an official debt of $15.8 trillion. This amount doesn’t include the liability from Social Security and Medicare. Adding in this liability (the exact amount varies by source) raises the amount of debt to somewhere over $120 trillion. With U.S. Federal tax revenue of just over $2.3 trillion, the country’s debt-to-income ratio is approximately 5,082 percent. 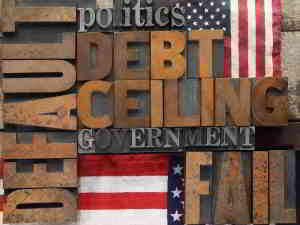 As of July 2012, America has $559 billion of debt left until it hits the debt limit. Currently the government’s monthly debts run between $100 billion and $125 billion which could cause us to hit the debt ceiling by mid-November. Debt management isn’t an easy task. Even the U.S. government has difficulty in balancing the budget and keeping spending under control. While your debt isn’t measures in trillions, it may still feel as large. This is where AmOne can help. Our experienced, knowledgeable associates are ready answer your questions on debt management, debt consolidation, financial planning, and more. AmOne offers solutions; your call to us is free and we won’t try to sell you anything. Find out how to reach us and learn more about how AmOne can help you today. Next Next post: What’s Your Plan for Social Security?